I say its simple because mankind has known about Nibiru for 6000 years. In ancient Sumerian tablets, written in cuneiform, that date back 6000 years. Nibiru is a word that the Sumerian people used to call Planet X. The Sumerian culture was located in the lower region of Iraq, between the Euphrates and Tigris rivers. This land was great for farming and was rich in resources. What I'm about to tell you next is quite mind boggling. The Sumerians (the oldest civilization on earth) wrote tablets and had a very precise map of the galaxy. Each planet is precisely sized and positioned correctly. How could they have known this information? They did not have telescopes. I believe the answer is simple. This map was brought to us from an ancient race of people that the Sumerians called The Anunnaki or "those who are from heaven came to Earth". They came to Earth after life on this planet had evolved for billions of years. It was at this time that the Anunnaki decided to make a worker in there own likeness, that could work, and learn from the Anunnaki. After many failed prototypes creating a supreme being on this planet from different species, a female Anunnaki Goddess, as she is referred to in Sumerian tablets, created the first male humanoid. This was done by taking 80% of our inferior (probably ape) ancestors DNA, and 20% of The Anunnakis. The possible reason why we have different races is because we all have a different level of Anunnaki DNA entwined with our ape ancestors. The people of Africa are in what they call the "cradle of life" because this is where civilization began. The Anunnaki later made an elite group of hybrids to rule the world. If you trace history you can easily see the bloodline. From royal families, to US presidents they all descend from the same bloodline! Ok i know what your thinking. What does this have to do with today? Well I'm getting to that. I'm assuming most of the world is misinformed so I'm explaining as much as i can, as quickly as i can. Notice the orbit path of Nibiru. It is a huge path skewing far off into and out of our solar system. It takes 3630 years for it to make its orbit. This planet exists folks. The planet Eris was discovered on the 21st of october in 2003. It is officially the largest known dwarf planet in our solar system. This cannot be all coincidence. On the winter solstice of December 12 2012, Nibiru or Planet X will be clearly visible and right next to earth. This will cause our poles to shift, cause earthquakes, volcanic eruptions, and create tsunamis. That date can also be tied back to another ancient civilization, the Mayans. This is when there calendar ends. You mean to tell me that 6000 years ago we knew about Nibiru and it wasn't actually seen until 2003? Something is going on. Don't be naive. Know the truth. Spread the truth. The ancient elite bloodline is still in charge of our media, you will never see anything like this aired on Fox Television. I hope i have enlightened you. If you have any questions please leave them in the comments. They are now calling the new planet Nemesis, or Hercolubus. I believe they keep changing the name because they know people are tying things together. There is another planet out there, and its shooting comets and asteroids our way via the oort cloud. There is a guy out there on YouTube that claims he has 100% proof that Nibiru, Hercolubus, or Comet Elenin what ever you want to call this huge planetary object, is headed in our direction. I have tried to explain what I can on the subject through this article, and I continue to update this page as I find more and more information. Some people are willing to believe this stuff, others won't allow their minds to be open to it. I want to show you this video because it has a lot of information about this coming planetary body. Could our Sun be a star gate? The sun is the original meaning of what a star gate is described as. The Sun is a star. I wonder if there is a technology out there that alien beings are using and/or have used that can harness the power of suns in the galaxy, and actually allow you to exit through any other suns kind of like a warp hole. What if you could travel to any star in the universe simply by going through it with the right technology? This is definitely something serious to think about. 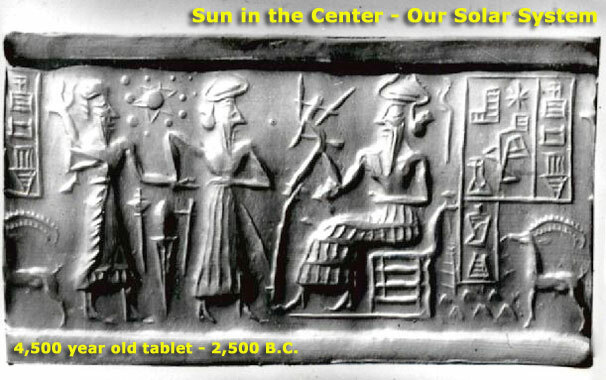 The sun has been worshiped throughout humanity. It is known by both science and most major religion as the "life giver" in every sense of the word. Check out this video and check out what this guy has to say. I definitely think he is on to something here. These images are straight from NASA and SOHO. This video was released on March 16th, 2011. I doubt you will have courage to publish my reply but I will write it in any case. Your "article" is wholey inacurate and presumptious. For example te Inocki, where do you get the info with regards the genetic mix? from the sky? your imagination or what? there are no accounts that I am aware of to suggest a genetic hybrid in Sumaria (Ancient Iraq). You are right when you say the Sumarians are considered to be the oldest civilisation, but this is not an opinion shared by all hystorians. The Sumarians captured in clay and stone what has been interpreted as their time of living with the Gods (Inocki) and according to you this was to generate a workforce, complete contrdiction to the actual tablets found in Iraq, the tablets suggest a time when the Gods were helping, nurturing and supporting their Gods, not manipulating and extorting them. The Dwarf or Micro Planet that was discovered can be better described as a large asteroid in reality, its trjectory has been mapped and it has a 500+ yr orbit od the sun and it will never come inside the orbit of any of the planets in our solar system, let alone be close to Earth. If Nibiru exists this discovery definately is not it. The Myan did predict an alignment in December 2012, this is correct also. The Myan also named the planets involved and described their orbits in quite astonishing detail, they did not however factor in an illusive planet X. It is a misconception that the Myan predicted the end or even tht their calander ends in 2012 because what is actually suggested is the Earths cycle, the length of time it takes Earth to be back in the exact same point in space in relation to the Sun will occure in 2012 but they do not suggest an end, quite teh opposite actually, a re-birth, the beginning of the next cycle, just like a New Year, only this is a biggy, bit like our millenium. It is easy to get carried away with ideas, but it does not achieve anything my friend. There are clearly things we do not yet understand but lets seek evidence for the answers rather than plucking ideas out of our rectums. Why did the Sumarians place Earth as the 7'th Planet?? Why 7? do we count from the middle or the edge? do we include Pluto? oh yea you also mentioned Polar Shift. Geolocical evidence suggests a gradual shift roughly every 100,000 yrs. Evidence that clearly contradicts the "Myth" you described, maybe this is why you decided to ignore it. Oh and if the 3600 yr cycle is true and so destructive please show me the evidence that the Earth was practically destroyed 3600 yrs ago 7200 yrs ago and so on. yea I have rambled on a bit, but far less than you, least I know what I am talking about. Or I certainly think I do, lets cut out the speculation and consider evidence and keep the debate alive. i find it interesting that the first comment on this site, Is a comment that tries to bash me. I advise you to Google Zacharia Sitchin. Much of my knowledge comes from him as well as other sources. But he alone speaks of a genetic alteration. If you want to bash me, at least get YOUR facts straight. Mine are straight as an arrow and i can reference my knowledge if you like. Im not writing a book report here. Wake up. If you want to stay naive great. You can't speak for all of us. I am aware of Zacharia Sitchin and his work and he does have some very compelling arguments but for him to say there were genetic hybrids without any evidence to corroborate it is fanciful. Please do not consider me to be a line tow'r because I am not sir and from what I can see the history books are deliberately written to deceive us, but I have considered this 12'th planet concept for quite some time and the stories do not even match the evidence they are based on. The Sumerians did not mention any cataclysmic events, far from it, they were grateful for the knowledge and ideas and support gifted to them by their "visitors". It seems apparent to me that the Mayan and The Sumerians have been deliberately misinterpreted to make this cataclysmic event appear to be real and bonafide. The Mayan Calender did accurately predict a celestial alignment and the cycle of their Calendar does come to the end in 2012, but what the sensationalist fail to mention is the fact they also refer to the new beginning of the cycle, not the end of times, but a new start of the celestial cycle, basically the clock is reset and when the planets are all back in the exact same place again the cycle will once again reach an end and the clock will be reset again. I have looked into the Sumerians and Nibiru and the concept of the 12'th planet and all I see is the same mis-info repeated over and over again. Repeated mis-info is still mis-info no matter how often it is repeated. There is no suggestion whatsoever that Nibiru is a destructive force and the historical record supports such an idea. Show me a million copies of the same story, a flawed idea and it will still be flawed Sir. The idea is not credible and your sloppy account is what I was analysing, not you Sir, I do not know you but I do know how to research and seek credibility of sources and information. I have not found 1 single piece of supporting evidence for the theory Nibiru is destructive and judging by the accounts of the Sumerians it may or may not actually exist. Zacharia Sitchin even inflates himself, suggesting the declassification of Pluto to a micro-planet is to dismiss his argument which is laughable and actually since writing his book, the Planet X the real world was looking for has been discovered, yes a planet 3 times the distance from the Sun as Pluto, it has a 550 year orbit of the Sun and scientists knew it had to exist just like how they knew Pluto had to exist. The math suggested there had to be something out there with a gravitational field. They found Pluto, did the math and realised it was not big enough to account for the shift in orbits so the search continued for the Planet X. Your Planet X is not the same, never can be and never will be. Please do not take my scientific and rational approach to a debate to heart. Humans and Apes have over 95% DNA the same as Humans so your arguement about the Races is obsured. The Human Genome Project supports this, curiously a grain of rice has thousands more DNA than a human, strange, but true. The conclusions of the Genome Projest were that DNA is not the be all and end all as first presumed. Google that Sir. Also the DNA migratory route of Humans has been traced back to Africa, our ancestors came from there. Different Races are the product of different environments, not different genes. Darwin made his first observations due to environment sculpting different variations of a bird called a finch on slightly different islands with slightly different fauna and other species, etc. google all that Sir. You make a great point. Maybe our understanding of physics and science, can not explain the odd planet x. And maybe the genetics thing could be argued, however the fact that the Sumerians were accurate in there portrayal of our solar system is true. The only thing we cannot explain is this mysterious "other" planet. This site was made to get people to open their minds on the subject. I am not saying the Sumerians were the first civilization, i am saying they are the first we know about. Thank you for taking a passion to your side of the argument, and i wish you luck in discovering the truth in the future, after all, that is what i am trying to do as well. I am not trying to spread lies about any race or anything. Like you said, i would appreciate you not taking my side of the argument to heart. I am always open for a good debate. I want to give you a "Thumbs Up" for your effort Ray, really the sentiment is true. I tooo think the people of the world deserve the truth. There are clearly aspects of society, history, democracy, religion that are NOT properly represented and the Power Elite seem to be casting a very sinister shadow over the truth, seems they have been doing it for a very long time too. So I think you and I are on the same side. Great blog - thanks for all the research and effort you put into it. I accidentilly stumbled upon this information on stage6 and it got me thinking. The one I watched displyed all the hystorical information then told me if I still didn't believe it I was to find the fact for myself. And I did... Right now I believe it... My friend agreed with it. He is a spiritualist and he said somehow it answered all his questions. Dont ask me how... Anyway... I belive Nibiru to be fact... It's like religion. Some believe in God some don't. Some believe in Nibiru and some don't. It's your choice in what to believe. The Governement and The Vatican always cloud the truth. I thank you for the blog. It's great work. I know a guy who has alot of information on this: Mohaioofstage6 on veoh.com or Mohaio on Stage6.com... Interesting fact. I've also read that 'Nibiru' is one of seven planets that orbit a red/brown dwarf star, which has this 3600 (+/-) Earthyear orbit around Sol. In either and, or both case, Earth is in store for some interesting events. At thirty-six hundred (Earth) years between appearances of Nibiru, what configuration is it when compared to the present solar system? From which direction it will be seen first? How long will it be visible? How close will it come to Sol? I understand that Nibiru's path crosses the asteroid belt plane; does that explain the belt itself? 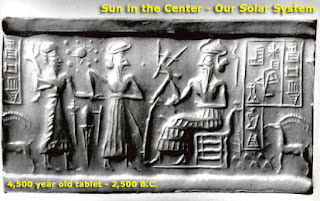 Is Sol the center of Nibiru's orbit? Or, does it loop around (like Andy Lloyd's pic,) with Sol at one end of a long elliptical orbit? 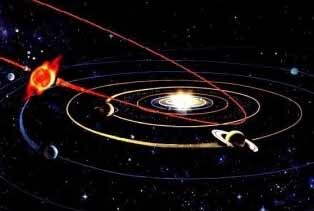 From the time it is within the orbit of the asteroid belt, how long is the estimated time until Nibiru is outside that point? What is it's estimated velocity and trajectory through the system? I am, as much as anyone, curious as what to expect. End of the day, if one wants to talk about history one needs sources and/ or references from credible sources. A primary source, even a secondary source would be better than this nonsense. It all sounds good, however is it accurate? Too many statements without proof or further explanation. I could only agree with the Mayan calendar date and the Sumerian oldest civilization in the world statements. Please do not write about historical events without proof. i really wish i didnt read this stuff. it made me relise how easily our earth can come to an end and we will all die. Well... normally I don't post to sites like this, but it IS an interesting and hotly debated subject. First, I'd like to commend MattG and Ray for successfully backing away from a potential mud-slinging campaign. It was beginning to look ugly, gentlemen. Kudos on the civilized behavior! As for Nibiru... I think it's a lot closer than most of you think. And a lot more mundane. It's our moon. As far as I know, the most recent (and widely accepted) theory regarding how the moon and Earth came to be the way they are was through a collision with another planet. It is now believed that our planet once had no moon and was a bit larger than it currently is. Another, larger planet passed close enough (possibly thrown out of orbit from Jupiter or the orbit between Jupiter and Mars) to hit the Earth. It did not do so directly, but as a glancing blow with both planets striking each other on their outer edges. The instant these two bodies struck, the heat created from the force of the impact caused both to return to a molten state. They exchanged material (right down to their iron cores! ), spun around each other a few times, and then separated into two distinct masses again. During the impact, some of the material from both was blown out into space. (It is even believed that the Earth may have originally contained more water than it currently does, but that's debatable.) The body that inhabited the original orbit (Earth) obtained the bulk of the remaining material, and the second body obtained what was left. The two bodies then re-formed into planetary spheres with the smaller of the two settling into an orbit around the larger. As a result, the moon is STILL settling into its orbit around Earth and is moving away from the Earth at the rate of about one-quarter inch per year. Eventually, by the time Luna's orbit completely stabilizes, there will be no such thing as a total Lunar eclipse! A woman who specializes in orbital mechanics has tested the theory using the mathematics and computer model tools common to astronomy. She has done literally thousands of computer-generated impacts and has determined the original orbit and tilt of the Earth, relative size of both bodies, velocity and angle of impact, etc. By changing certain aspects of the scenario, she was even able to determine that a second and third moon could have resulted from the impact, but their orbits would have never stabilized, and they would have either crashed back into the Earth, flung out into space, or impacted one another. I agree with MattG about the cyclical nature of the Myan calendar. Everyone has been using this and similar curiosities for the sake of validating some theory about the end of the world. Even Nostrodamus said that his predictions about the "end of the world" really weren't about the true end, but about the end of the world "as we know it" and the beginning of a new way of life. As for the 2012 predictions and their connection to some great cataclysm... haven't we heard all of this before? (At least we older farts have!) About two decades ago, everyone was in a tizzy about the "Great Alignment" when all the major planets in our solar system would align on one side of the sun. This was supposed to trigger all manner of disasters. Guess what? Nothing happened. I believe in many things that the rank-and-file refuse to even consider, but I find it hard to believe that our sun aligning with the black hole at the center of our galaxy is going to cause even so much of a cosmic burp. If anything similar to this is going to happen around 12-21-2012, I would think it would be the beginning of the much-anticipated "Age of Aquarius." I am not convinced that much of the supernatural hype surrounding the great teacher, Yeshua (Jesus), wasn't allegory designed to illuminate the end of the "Age of Pisces" (which we are currently said to be in). His symbol is a fish, he performed a miracle with two fishes (the exact sign for Pisces), many of his parables and life's events revolved around fishing, and one of the few phrases attributed to him that actually seems to have been said by him was, "I will be with you until the end of the age." And I don't want to hear from 'lil ray ray'. We all know the christian view regarding... well, everything! All your objections are already duly noted and acceded to. No need to re-hash them for the 20 billionth time. Contrary to christianity's greatest wish, not everyone believes as you do. While MattG makes a good point about the arrogance of Zaccharia Sitchin, the decision to downgrade Pluto's status as a non-planet was obviously because the IAU was less concerned with whether Pluto was or wasn't a planet and more concerned with having to admit more "members" to the Solar System Club. The IAU's new definition of what it is to be a planet is arbitrary and nonsensical, and it clearly indicates nothing more than a desire to keep Pluto and any future Kuyper Belt objects out of the "club." I think our ancient civilizations were showing much more intelligence when they included other bodies in their planetary count. Reading what has been posted here (specifically by Ray and MattG), I'm starting to get the picture that some of our ancient civilizations didn't so much attribute planetary bodies to their various gods as they might have actually worshiped those bodies AS gods. I mean, let's say the older societies like the Sumerians actually worship the planets themselves, then a later civilization like the Romans made the subtle switch to worshiping God who are linked with a specific planet. I don't know. Just an impression. Thank you everyone for your constructive comments and criticism. JESUS IS THE TRUTH ...EVERY THING WHICH TAKES AWAY YOU FAITH FROM JESUS IS CREATED BY DEVIL. IF U DONT HAVE THIS KNOWLEDGE THEN YOU ARE NAIVE. How am i taking away your belief in jesus? I have faith in a grand design and sacred archetypes. Lets try to keep religious mumbo jumbo that was designed to segregate mankind on a different blog. By the way every religion of the world has been responsible for many major conflicts and wars. For all you christian finatics that chose to bring jesus up, try not to forget the crusades, or the inquisition. Burning scientists for being free thinkers and being accused of devil worship. Go to school, church is good but dont let it control your life, or you are no better then a Muslim extremist ready to die for Allah. Think of the bigger picture not your corrupt religion. As we are each a product of our upbringing, and no human on this lonely planet has full knowledge of earth's true history, so we can never be certain about the future. Through my life, raised a Christian, I can tell u this... Religion is man made. We learned it from our parents, and they from theirs, and onback, just as many human tendencies carry on from generation to generation. We learned religion. Perhaps the real answer is obscured by religion? Intentionally? Perhaps. As mentioned previously, the Spanish destroyed much evidence of the mayan's accumulated knowledge regarding our planet's history and future. Perhaps there is a planet Nibiru? Perhaps not? But we do know that our history books, and what is taught to us in school is a lot of lies. There has been much evidence presented that would argue for the human race having been much more intelligent and advanced so many years ago. At some point, much of the knowledge was lost as civilizations fell, and we were left to start over again. The last time that things sort of started over, we had no idea of our recent history. One example, is that our history books taught us in school that Christopher Columbus discovered north America. So stupid. North America had existed for many thousands of years prior to his arrival and visitors had already been there, as evidence suggests. So you can see how easily the past is forgotten. How can anyone say that their own religion is the correct religion? Were you there at the beginning? Having knowledge and being naive are entirely different things. I do not think the original post was intended to create a religious dispute as most of you GOD fearing people are so closed minded I'm surprised your actually reading this. Pluto was the only planet not discovered by a European. This galled them to no end, but all is well. Every "planet" in the solar system once again has a Euro-Father. planet x Exists and we will all die in another year, well at least a very very very large portion of us. I just hope that you all are not ignorant enough to not buy enough supplies to last a few months until planet x leaves our orbit. It is possible some of you will survive... although your mtv and facebook will no longer exist. Regardless if "ray" is 100% correct or not is irrelevant because we are all going to die. Niburu is called At-Tariq in the Quran. It is described as a piercing star. At-Tariq literally means 'Night Visitor'. It was described by Prophet Muhammad and his closest relatives as a star that travels into the 7 spheres of Heaven, and returns 'crossing' the orbits of the planets in our solar system (counter orbit). The Anunaki are comparable to Jinn in Islam. The Jinn lived on earth for approximately 7,000 years before Allah created Adam. They were the first of the earth's inhabitants to indulge in mischief and bloodshed amongst each other. Allah told the Angels that He would create a ruler in the earth. The Angels asked if He would create such as would cause mischief and bloodshed. They were informed by Allah: 'I know that which you do not know'. Then He created Adam and decreed that mankind would receive Prophet's, Messengers, Pure Leaders, and Believers. Then Allah removed the Jinn from the earth and placed them in the ethric dimension that surrounds the earth, thus separating the two (Jinn and Mankind). This would now make them space creatures. The Jinn have the ability to travel through space. The Jinn can see mankind, but we are unable to see them (under normal circumstances). However, it is possible that the Jinn will be able to appear during the period of the crossing. It is said that they will have more direct access to this dimension. It is reported in haddith that shayteen (demons) will be able to interact with human beings. Another theory is that the light spectrum will open up, allowing us too see what has been hidden from our eyes in the ethric plane. Note: Cameras are able to photograph these creatures. They are often thought to be ghosts caught on film. Whatever the case may be, the Alien theories will be a good way to explain to humanity what we have finally come in contact with. So people may not realize that these Anunaki are actually demons. Furthermore, the demons will be under the command of Ad-Dajjal (anti-Christ). If humans are convinced that they were created by the Anunaki, then it will be that much easier to convince humans that Ad-Dajjal is god. First to say that your theory is wrong. Jinn's or Devil's are the same creatures made from one kind of energy (from fire). They are soulful creatures hidden in parallel dimension right here on Earth. Russian scientist have found video camera that can record them in space around us or in humans. Russian scientist also found some kind of audio recording device when they put it into some old graves it can be heard recoding like human voices of screaming. You probably know what is (azab in kabur). That is very well explained in Kur'an that some people will be punished after death on place callled "kabur" and will be tortured hundreds of years with "Hell's snakes" called "Zebaniye". Creatures made of energy similair to our souls. Russians scientifically proved this fact! You know in the beginning of Kur'an is sentence. Dedication for Humans and Jinn's. Well this is also now scientifically proved. All that story's about Anunaki is just previous destroyed human civilisation's story. Why they are destroyed? Well that is the main point that we have to understand. This civilisation also have responsibility in front our Creator. Our Creator is out of time and space. He is always on all places at the same time. He is Creator of universe. Our mind cannot comprehend this at all. We are too small to understand such things. that we can do, is to prove God's existence by science. "Ayetul kursija" Kur'an- Bekare. Very interesting is that Nostradamus was wrote about one man called "Genius". This man will make biggest discoveries in science for human karma. We will recognize him by this event: He will prove Einstein Theory of relativity to be wrong! After that he will make some patents that will took us to imaginable parts of universe physically. And the biggest thing that he will discover is that He will prove God's or Creator's existence by science. Metaphysically connection between human body and universe. Indirectly he will prove that Creator exists. There will be no major cease of life on the planet because we are in the middle of the cycle. At the 2500. year will end. (source: women that lives in astral and material at same time, due to her previous illness) interviewed at Edgemedia TV. So we have to be better humans, to spread love between us. That is the right path. But some of humans are really bad. They cannot see anything except matter. Rulers of the world! How many times we will see the same film. Romans Empire, Hitler, Antichrist... Only blood I am afraid. But all this was predicted, what means that "everything what is happening, is happening by will of God"." Vellahavle Vellakuvete" Kur'an. All of this is interesting, but I believe some information has been omitted. Start with the Annunaki...evil or good? Well, records show that they originally came here to mine gold and that they may have played with our DNA to make us good workers so they didn't have to do all the hard labor. That would make them evil... greedy and completely lacking in empathy for us, as we were just trainable animals to them. The Annunaki claimed they "created" us, but perhaps they were claiming credit for someone else's work. Perhaps they already had taken God's perfect creation and manipulated it for their purposes, and like all good sociopaths, took all the credit for themselves. My reasoning? Adam and Eve. God created them. They were "naked and not ashamed." The serpent [the Bible also refers to him as a dragon (reptilian alien??)] offered Adam and Eve the forbidden fruit and when they said God had forbidden it, like a good predator, the serpent "took their side" and told them God just didn't want them to be as great as He was, if they ate it, they would be like God. Did we end up like God? I think not. Instead, with our DNA altered, we became slaves to the reptilians, thinking, feeling, and believing as they chose and assisting them in building a worldly kingdom over which they could assert dominance. But God so loved the world...he sent Jesus with a "fix." He came to "purify" and to "set the captives free." We simply have to accept Him and reject the darkness that envelops the world. The Bible states that in the last days, "darkness shall cover the earth and gross darkness the people." Satan (reptilian?) told Jesus that he would give him all the kingdoms of the world if He would bow down to him. Satan added that the kingdoms were his to give. They rule the earth, read our minds, control our thoughts. Without help from God, we are their pawns. God bless everyone that reads this. "He that has an ear, let him hear." Some Stupid comments on here to be honest, such as "we're all going to die". erm no.. nobody is going to die, even if there was a planet x and it went through our solar system it wouldnt affect us anywhere near the level you are making out. The only way this world as we know it will end is down to us. We've fucked ourselves and the greedy bastards in charge don't know when to stop doing what they're doing, and they won't stop until it's too late. I hate the way our governments have the lazy, greedy attitude of 'lets cross that bridge when we come to it'... they will be the death of us all one day soon.